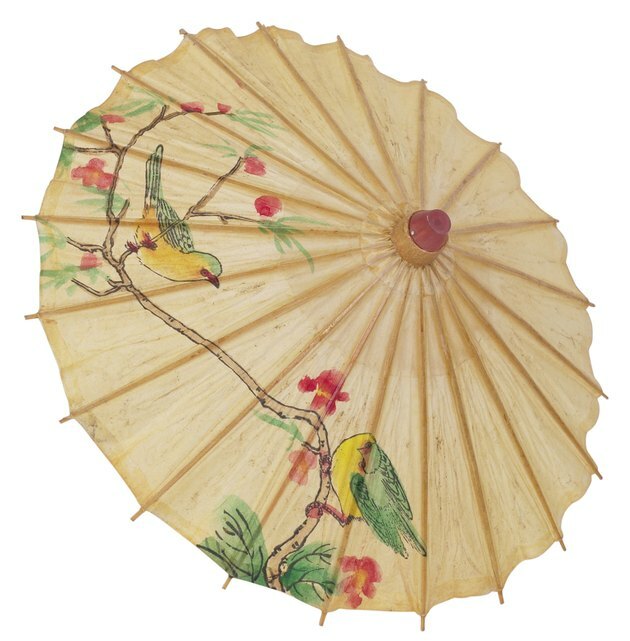 Paper parasols come in a variety of colors and designs, adding femininity to any room decor. If you want to display an open paper parasol in the room, hang it out from the wall like you would a flag. Flag brackets come in a variety of designs, allowing you to adjust the angle. Displaying the parasols on brackets on each side of a bed will create a canopy effect. To display the umbrella flat on the wall, you will have to remove the parasol handle. However, the result is a unique piece of three-dimensional wall art. Display opened paper parasols on the wall and add dimension to your decor. Use a stud finder to locate a stud in the area where you want to hang the parasol. A paper parasol is light enough to hang it on the wall without connecting it to a stud, but if the location of a stud works with your design scheme, this method would be best. Set the handle of the parasol into a flag bracket and align it on the wall. Use an assistant to hold and move the parasol while you approve its location or vice versa. Remove the parasol and drill holes through the bracket's screw holes. Screw the bracket to the wall. If you are screwing directly into drywall, use drywall screws with an anchor to support the weight of the bracket. Open the parasol and lock it in place. Cut off the handle of the parasol with a hacksaw at least 2 inches below the mechanism used to secure the umbrella open. Wrap a piece of duct tape around the remaining handle three or four times to ensure that the umbrella will stay open even if the locking mechanism fails. Screw two screw hooks into the wall 4 inches apart and approximately 2 to 4 inches below where you would like the top of the umbrella to hang. You do not need to worry about locating a wall stud for these hangers. Cut two 12-inch pieces of fishing line. Tie one piece of fishing line to an inner umbrella spike near the center of the umbrella. Tie the other piece on the adjacent umbrella spike. Loop the loose piece of fishing line around each of the hooks and adjust the length until the umbrella hangs as desired. You will need an assistant to hold the umbrella while you tie off the lines.